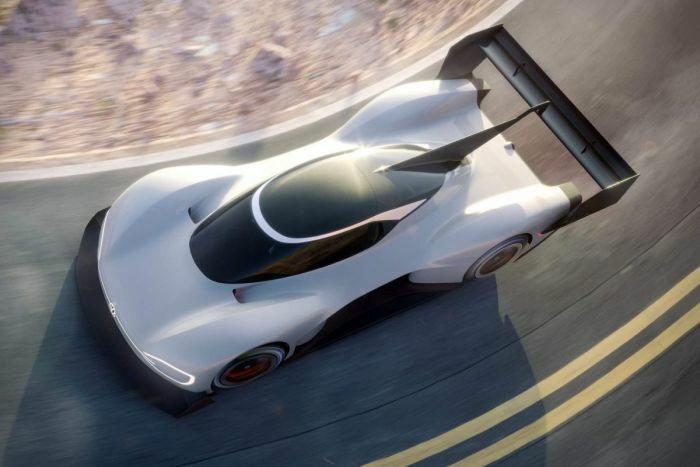 In just a couple of hours now, we’ll know whether Volkswagen has taken the record time at the Pikes Peak Hill Climb. Volkswagen has developed a specialized member of the I.D. car family, the I.D. R Pikes Peak, that it hopes will set a new record today. The driver is current champ Romain Dumas, who has been piloting then lightweight racer on the course for the last couple of weeks, as he settled in behind the wheel. The engineering group also dialed in the final settings for the hill climb. Faster than a Formula One car, the I.D. R Pikes Peak uses a pair of electric motors for its power. The electrical system, which also features a regenerative braking system to pick up extra power, turns out about 540 horsepower. The I.D. R Pikes Peak weighs about 2,400 pounds. Key to the I.D. R is its rear wing. Because it is running as an unlimited electric, the engineering team pulled off some exciting developments, including the enormous rear wing. The rear wing gives the I.D. R Pikes Peak a massive amount of downforce so that single-seat racer sticks to the road as if it were on rails. The wing, when combined with the all-wheel-drive system, means that Dumas has a vehicle that will handle quite well. To date, the record for the 12.4-mile run is 8:58 and change. VW hopes that its entry will crush it, leaving the old record in the dust. We’ll know sometime early this afternoon whether VW has accomplished its goal. The Pikes Peak Hill Climb or the Run to the Clouds is set to run this afternoon at the famed Colorado site. More than a century ago, the first hill climb occurred, as a way to show the capability of the cars then. It’s still the same way today.